James from Vinton, IA asks: I turned 70 in February this year. I have been taking monthly withdrawals from my IRA since age 65. Will the withdrawals I took prior to turning 70.5 this year count toward my required distribution? Cameron from Iowa City, IA asks: I have recently been considering a career change, and have always been interested in the finance world. Do you have any advice for someone who is looking to be a financial advisor? 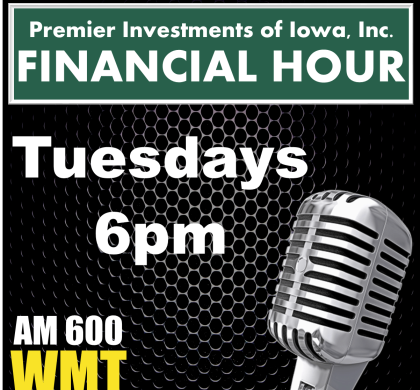 Plus they discuss the changes to the 2018 Retirement Plan Contribution Limits. Slight increases have been made due to mild inflation. If you are single and participate in an employer-sponsored retirement plan such as a 401(k), your new phase-out range is $1,000 higher: $63,000-$73,000. Joint filers who also contribute to workplace plans have a phaseout range of $101,000-$121,000, a $2,000 increase. If you want to contribute to an IRA and do not contribute to a workplace retirement plan, yet your spouse does, your phaseout range is $3,000 higher: $189,000-$199,000. ​This material was prepared by MarketingPro, Inc., and does not necessarily represent the views of the presenting party, nor their affiliates. This information has been derived from sources believed to be accurate. Please note – investing involves risk, and past performance is no guarantee of future results. The publisher is not engaged in rendering legal, accounting or other professional services. If assistance is needed, the reader is advised to engage the services of a competent professional. This information should not be construed as investment, tax or legal advice and may not be relied on for the purpose of avoiding any Federal tax penalty. This is neither a solicitation nor recommendation to purchase or sell any investment or insurance product or service, and should not be relied upon as such. All indices are unmanaged and are not illustrative of any particular investment.